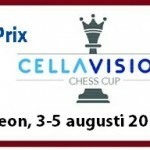 The Cellavision Chess Cup is an 8-round Swiss tournament taking place from 3-5 August 2018 in Lund, Sweden. It starts off with four Rapid games with a time control of 15 minutes for the entire game, plus a 5-second increment starting from move one, followed by four classical games with 90 minutes per game and a 30-second increment. In parallel with CellaVision Chess Cup the Small CellaVision Chess Cup is open for players with elo rating below 1600. 185 players are taking part in the main event.